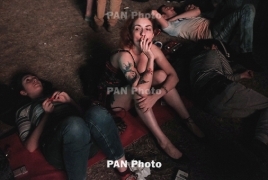 PanARMENIAN.Net - 1․580 billion packs of cigarettes were produced in Armenia throughout 2018, of which 1․353 billion were exported, while the remaining 227 million packs were consumed domestically. According to the National Statistical Service, additional 162․5 million packs were imported in 2018, raising the amount of cigarette consumed inside the country to more than 389․5 million packs. A packet of cigarette cost AMD 416,9 last year. Armenians spent AMD 445,362 on 1.068 million cigarette packs per day, and AMD 162.557 or $338․7 million per year. 373․8 million packs of cigarette were consumed in the country throughout 2017.